I'm currently a lapsed outdoor volunteer. Before I became a mom I spent plenty of weekends volunteering at peninsula open space preserves. I did all kinds of projects: fence building, seed collecting, invasive plant removal, trail repair, and twice, trail building. The later was no doubt the most complicated; full days of closely supervising digging, scraping, filling, retaining, packing, and more. But I never thought too much about all the work that led to the trail building until I got word that the Midpeninsula Regional Open Space District was preparing a master trail plan for La Honda Creek Open Space Preserve. This little-known preserve stretches from Skyline Boulevard (just south of El Corte de Madera Open Space Preserve) southwest to a boundary at Highway 84, past the town of La Honda. The preserve's best known feature is the "big red barn" right along Highway 84, but the barn and that part of the preserve are closed to the public. The only accessible part of La Honda Creek OSP is in the northern section of the preserve (with a trailhead at the end of Allen Road), and that area requires a permit to explore. 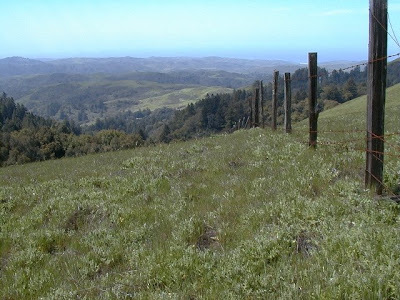 As indicated in the master trail plan, MROSD considers La Honda Creek OSP a "gateway to the San Mateo coast," and is considering miles of new trails (see the pdf) and several new trailheads for the preserve. This is all very exciting, especially if like me, you've hiked the upper part of La Honda (this photo is from a 2001 hike) and have been lucky enough to get a glimpse of the area around the Red Barn (volunteering does have its perks!). There aren't many trails on the west slope of the Santa Cruz Mountains, and La Honda Creek has a great deal of variety, with some massive Doug firs, amazing ocean views, and beautiful grassland. Also incredible is the work that goes into preparing a master plan. In pdf format the master plan is 402 pages long. Staff have considered everything: water resources, sensitive biological resources, regional trail connections, access for disabled visitors, and on and on.